So here we are. Three posts in, and I’m finally going to embark on my first quest. Tactics, for those of you not in the know, is the sphere that focuses on physical strength. 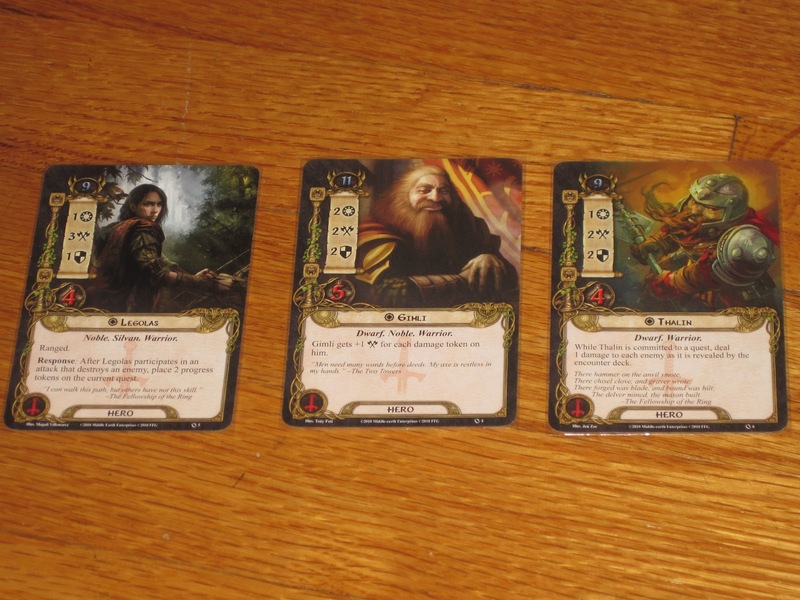 It’s also the sphere wherein I recognize all three heroes included in the base game (Gimli, Legolas, and Thalin). 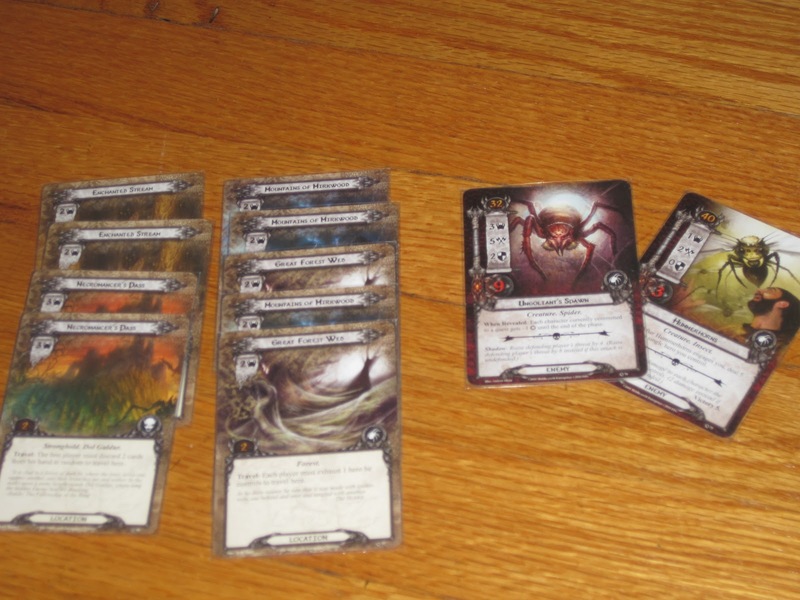 I looked at their stats, was impressed with their attack values, and rushed to fight Ungoliant’s spawn. What can go wrong? I thought. Everything. That’s what can go wrong. The three tactics heroes from the core set. The first problem I faced was questing. While the tactics deck is big on offense, it is terrible at what we might call finesse. 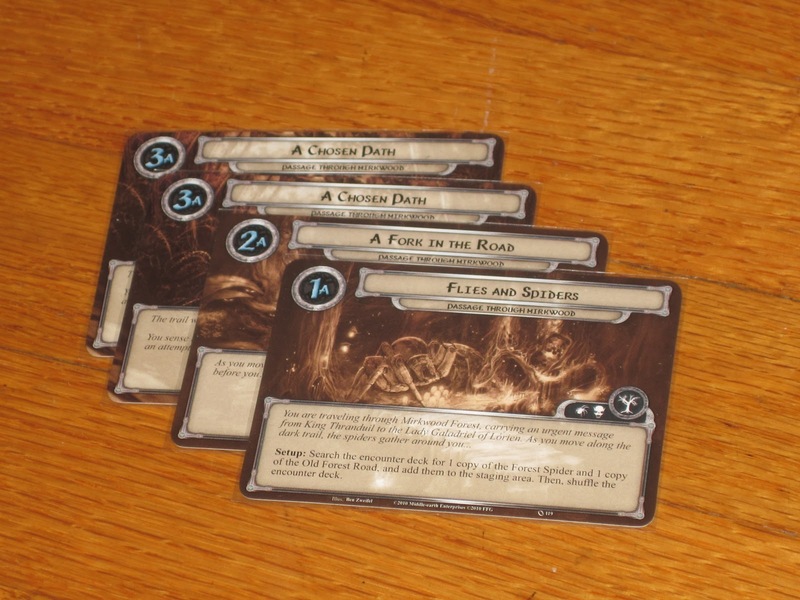 The Lord of the Rings LCG requires players to manage a number of disparate annoyances from the encounter deck. First, the player must deal with the shadow: this happens in the quest phase, and players compare their questing characters’ willpower with the shadow level of the revealed enemies and locations. Then, players must be adequately prepared to defend against the enemies that the encounter deck reveals (defending). And finally, if players want to make any progress in the game, they must be in a position to strike back against the enemies. These three tasks require willpower, defense, and attack traits, respectively. Tactics is great on offense, decent on defense, and terrible on willpower (especially when considering allies and supplemental cards). Its characters are awesome once they’re in battle, but getting them there is a chore. The problem with balancing the three demands of questing, defending, and attacking is that each of them requires committed characters. As in Magic and other CCG-style games, most actions require a character to exhaust (“tapping,” in Magic parlance), meaning you are not likely to be able to use the same character twice. A decent character like Gimli, who has 2W, 2A, 2D, cannot commit to a quest, defend against a forest spider, and strike back as well. The tactics heroes aren’t great in the willpower department, but the tactics allies are terrible. This requires using the heroes you had planned for bathing their hands in spider blood as scouts instead. Another problem is that many of the tactics allies also have low defense values and hit points in addition to their paltry willpower. This makes them useless for questing and quickly expendable in battle. The tactics deck, in addition to these barriers, does not have a good system of gaining additional resources to pay for its allies, events, and attachments, so it’s hard to build a stable of decent characters to get anything done. I thought the cards on the right would be my problem. Instead, it was the cards on the left. Now back to the encounter deck. The Passage through Mirkwood scenario includes lots of locations. Locations aren’t terrible when you have decent questers, but when you don’t, the locations’ shadow level piles up in the staging area, making it impossible to advance in the scenario. The tactics sphere wants enemies to fight, but instead of getting enough enemies, the encounter deck seemed stacked with locations. If I had paid attention in my initial survey, I would have learned this. So this is how a turn usually worked: gain resources and immediately spend them on red shirts; use Thalin and maybe Gimli to quest (depending on how high the shadow was); barely tie (or sometimes lose) the quest, thus making little or no progress; enemies attack and kill the red shirts; Legolas and maybe Gimli strike back against the spiders (but are not effective in defeating them in a single turn); threat gets raised. Lather, rinse, repeat until dead. 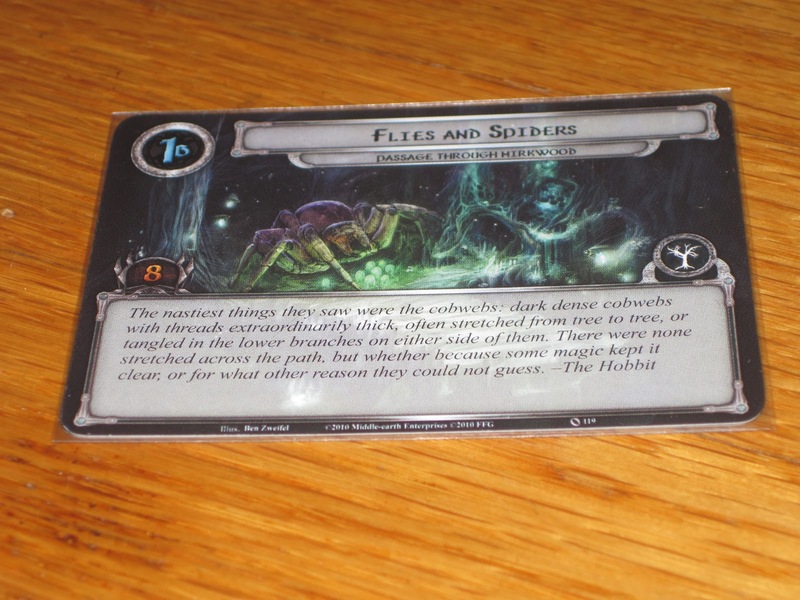 The first scenario card. I didn’t see the second. In five games, I did not advance beyond the first quest card. And this is the easy one? In my next post, there is hope: I’ll explain what I learned from my failures–and what I did to eventually defeat this scenario.